"The discover Essen City Tour"
Groups travelling with their own bus can enjoy our classic tour. Our city tour offers everything that makes Essen special. As well as the Zollverein UNESCO world heritage site, Lake Baldeney, the Old Synagogue and the Margarethenhöhe garden city, there are highlights such as the new Krupp belt or the Folkwang museum. Denkmalpfad ZOLLVEREIN®, in English "Monument Path", brings industrial history back to life. On guided tours through the originally preserved above-ground facilities visitors experience what it meant to be working at the once most efficient coal mine in the world and Europe’s largest coking plant. The participants follow the "path of coal" above ground, thereby gaining exciting insights into the work as well as the life of miners and coke oven workers. Furthermore, the tour guide explains descriptive details on architecture, industrial nature and the change of the Zollverein World Heritage Site into a modern cultural location. 30 different guided tour formats in up to 8 languages guarantee unforgettable experiences for all age groups. The offers of Denkmalpfad ZOLLVEREIN® also include the ZOLLVEREIN® round trips, which make it possible for visitors to comfortably and quickly explore the World Heritage Site by E-Bus. During the trip, a guide from Denkmalpfad ZOLLVEREIN® imparts interesting information on the history and architecture of the facilities. In passing, the participants get to know all important buildings at Shaft XII, Shaft 1/2/8 and the Zollverein Coking Plant. "Where there’s a villa, there’s a way." The rich industrial history of the region didn’t just leave us a multitude of significant industrial monuments but also with an impressive number of bourgeois villas. Discover the early entrepreneur villas in Horst and Werden, the Moltke quarter featuring the garden city and the Bredeney district. Structural change within the Krupp Belt. In virtually no other area within the Essen city limits can structural change be better experienced first-hand than in the new Krupp Belt. This was once the densely built-up core of the extensive Krupp Works. Today you will see new residential areas, service areas, and a 24-acre park on the 2.5 square kilometre area adjoining the new ThyssenKrupp Headquarters. The tour is ideal for school groups and student groups studying the topic of structural change. Ruhr valley and Deilbach valley. This excursion to the early centres of industrialisation presents 800 years of coal and metal processing. It is hard to conceive that the idyllic Deilbachtal and Ruhrtal were once the cradle of industry in the region. The medieval and early modern hammers and portals are only part of the historic treasures we can find there today. Art Encounter: The Folkwang idea. The name Folkwang doesn’t just bedeck the museum and the Folkwang University, but a whole movement. The Folkwang idea originated in Hagen and didn’t arrive in Essen until the 1920s. But even before the First World War the Folkwang movement had influenced a notable number of significant building projects. The journey leads to the architectural witnesses of the Folkwang concept. Fundation women, working women and bussiness women. Women have left a definite mark on the history of Essen. Which other German city did women rule for almost 1000 years? But even after the dissolution of the foundation in Essen courageous and confident women have influenced the history of the city. This tour goes on a brief historical quest. En route over blue stones. This culture trail on the south side passes the works of art displayed in open spaces. You will simultaneously be given an insight into the history and development of the city. The final station is the Folkwang museum. Afterwards: there is the chance to have a cup of coffee or to browse through the museum at one’s leisure. The Krupps before the Krupps. Krupps and the city of Essen have a chequered relationship with its roots going back 225 years before the founding of the company in 1811. On this tour you will be taken on a quest into the past. We will also try to show the future prospects for both the city and the company. A tour through the inner city shows that the city has a lot more to offer than its many shops and department stores: from the Handelshof hotel past the cathedral with one of the most valuable European church treasures, the old synagogue and the Essen town hall right through to the Colosseum theatre. Founded 1200 years ago by Frisian missionary Liudger, Werden is the oldest district in the city of Essen. The St. Ludgerus basilica with its famous treasure chamber, the abbey residence, today the seat of the renowned Folkwang University of arts, the Lucius church with wall paintings from the 12th century and the historic homes and alleyways give this area its own special charm. The unforgettable football legend Helmut Rahn is deeply ingrained in the history of Essen. Born in the city, he learned his trade playing for local Essen-based clubs. But it was at Rot-Weiss Essen where he spent the majority of his career and left the biggest impression. On this tour, we retrace the footsteps and look back on the career of Helmut Rahn in the city. The journey concludes with a glance into Essen’s stadium. This tour takes place in cooperation with Rot-Weiss Essen. 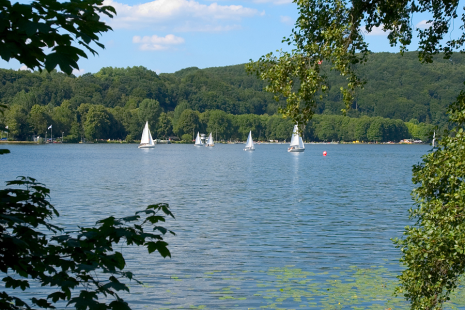 From the historic English garden to the industrial culture park, Essen boasts a great variety of outstanding park areas and gardens. No wonder it’s been crowned the "European Green Capital" of 2017. By taking a tour with an expert guide, you will get to see and visit a selection of these green areas.